A native of San Francisco and long-time resident of Spain, Francisco Aragon is the author of three limited-edition chapbooks, most recently, Tertulia (BOOKlyn). He is the founding editor and publisher of Momotombo Press, which promotes emerging Latino writers and is housed at the Institute for Latino Studies at the University of Notre Dame, where he is a Visiting Fellow. He currently resides in Elkhart, Indiana. 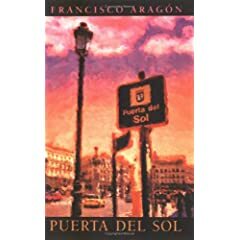 In this most recent collection of poetry, Puerta Del Sol, Francisco Aragón has chosen to include a Spanish language counterpart of what is referred to as an “elaboration” instead of a “translation.” Here, Aragón has chosen to include the English and Spanish versions of his poetry side-by-side with his own translations. The personal significance of using the Spanish language is that his Nicaraguan mother raised him as a Spanish speaker. It is evident as the poems come alive with their English equivalent that this collection celebrates Aragon’s heritage and language. His own Spanish, a hybridization of culture and poetic vision stemming from his many years immersed in Spain, Aragón calls upon his knowledge and abilities as a native Spanish speaker triumphantly. The book is divided into three sections, each with its own slice of personality and recurrent theme of light and longing for family, friends, and the familiar throughout. In the section II, the poet returns to the familiar surrounding of his childhood and family in the city of San Francisco and he contrasts this with the memories of his time in Spain; the specificity and details from “Winter Sun’s,” such as “the newly scrubbed neoclassic/ façades along Alacalá” and “Mario’s on Telegraph/ and Haste: tamales, beans and rice” bring a specificity and particularity that is found throughout Aragon’s collection. The most compelling of these poems can be found in Section II and Section III, which illuminate the distance he feels from America, his family, and the life he has begun in Spain to a resounding close. In “Luz, Yogur, Leche de Fresa” the use of assonance in the line “y el cielo suelta un distante/ sonido ondulado” helps to recreate the sound of “the sky letting loose a distant/ ripple of sound.” Also, “Madrid in July” has the simplicity of being about an afternoon in Madrid, but the use of sensory details allows the reader to lose himself magnificently. The star of this poem is Aragón, who manages to take us back to when he was 12 years old and transcend the pathos of time to this resonating nostalgia. Aragón achieves his aim to preserve what he calls “the pleasure of sound.” His deliberate “elaboration” and not “translation” of the poems create a complimentary portrait. The accompanied Spanish version of the poems provides a further richness to the narrative of each poem through the complexity of the Spanish language. The diversity of diction in Spanish allows the reader to gain insight through tone and inflection which are missed in the English version. Aragon’s has succeeded in crafting quality poetry and the use of Spanish allows a more rhythmic voice to come through in each poem and creates a moving and lively group of images and vivid storytelling to overtake the poems and really open up each poem to the reader. Each poem is in essence opening the door to the poet’s mind and experience; they are the door to something greater, la Puerta del Sol.